If you follow me on Twitter, you may have already seen my tweets on the matter. It’s no secret that I’m a fan of American Express programs designed to increase their customers’ loyalty – and last summer, they aimed at the social media savvy by partnering up with American Express. Last Thanksgiving, the Saturday after Black Friday (after Thanksgiving Day), was a day they declared Small Business Saturday. If you spent $25 at a small business, you got $25 statement credit. Fortunately, the program was such a success they decided to extend a $10 statement credit deal to American Express members that are also on Foursquare. Yay! All you do is sync your Foursquare account with your American Express card, and then start shopping. When you’re searching for venues at which to check in, small businesses participating in this Amex deal will show the orange “Special” tag in its listing, so you know what to look for. Just pay with your American Express and the $10 credit appears on your statement “within 3-5 business days,” according to Foursquare. I’m currently awaiting mine. I’m not exactly sure when this deal ends, but it was touted as “limited time only,” with my reading word around the web that it could end very soon! Maybe even today? So I’d definitely sync up my card right now and get shopping! The great thing is that small businesses encompass tons of food, retail and services you never even thought of. 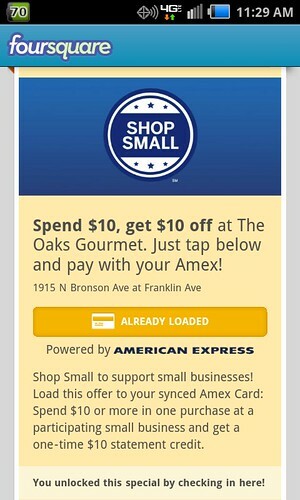 Just check what Foursquare check-in Amex specials are nearby wherever you are, right now. The drawback in fine print: “Limit one $10 credit across all participating merchants.” What a waste of so many small business options to choose from, right? I guess at least they’re getting the neighborhood attention they deserve by showing that “Special” tag in their listing. Happy shopping! And Happy New Year! Check in on Foursquare when you shop/eat at small business, load “special” onto card. Pay with AMEX and receive $10 statement credit in 3-5 days.